Discharge of “greenhouse” gases (carbon dioxide, methane, nitrous oxide, etc.) into the atmosphere, mostly from fossil fuel combustion, agriculture, and forestry practices has produced the highest concentrations experienced in at least the last 800,000 years. No single technique appears likely to control greenhouse gas increases in the atmosphere, but mesoscale ocean experiments have shown that fertilization of regions of the ocean that are deficient in iron but otherwise replete with macronutrients can lead to significant increases in primary production, reductions of CO2 in the surface layer of the sea, and potentially add to the ocean’s essential role in atmospheric CO2 attenuation. Key questions remain, and there are many theoretical and practical reasons to explore the larger-scale response in a representative iron-deficient region of the ocean to experimental fertilization. Potential toxicity of the iron fertilization solution. pH and dissolved oxygen concentration effects of the fertilization and subsequent algal growth, settling, and decay. Ecosystem effects including food web shifts that could impact higher trophic levels or benthic organisms. Formation of undesirable by-products such as toxic algae, N2O, and CH4. Down current effects due to nutrient or oxygen depletion from the fertilized patch. Efficacy of the fertilization—the stimulation of algal growth may not result in the settling of algal detritus from the upper water column. 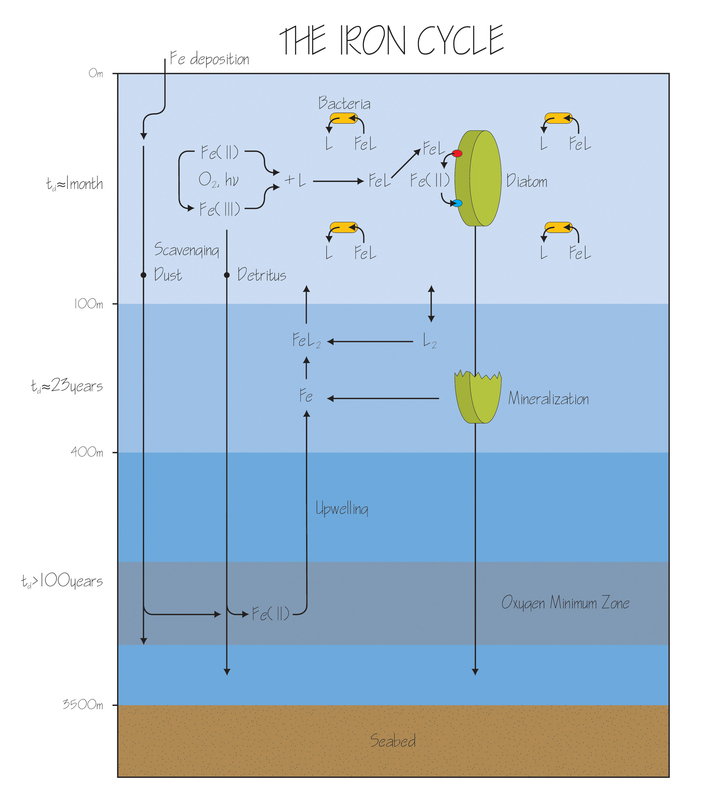 The Tetra Tech Research & Development Group developed a conceptual model of ocean iron fertilization (OIF) that describes and graphically represents existing knowledge on biogeochemical processes that interact in the sequestration of organic carbon. The roles of nutrient cycling and the cycling of organic matter in the mixed layer of the ocean are also discussed. Together the descriptions of the biogeochemical cycles and the results of the previous OIF experiments are used to address the potential environmental concerns regarding OIF and questions about the efficacy of the proposed approach.